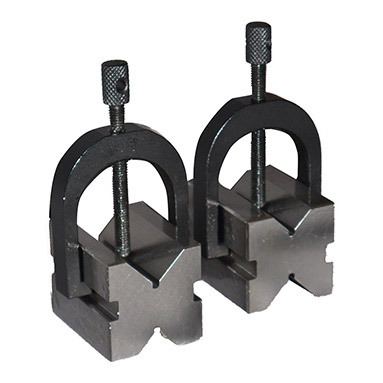 This Precision V-Block Clamp Set is designed for checking precision machine parts, general workshop use, and holding stock when drilling and milling. V's are central, parallel and square (and are supplied in matched in pairs with 2 clamps). Made from heat-treated, hardened tool steel for durability and extended lifespan. Geometrical accuracy as per BS 3731/DIN 2274 Grade 2. Permissible height difference for matched pair within .0003" or 8 microns. Parallelism tolerance of v axis to base within .0004" or (10+L/50) microns. Perpendicularity tolerance of end and side faces to base within .0005" or (10+H/25) microns.